A tea kettle, buzzing cicada or screeching noise? Tinnitus suffers are being invited to use a new online, sound matching tool to help better understand their type of tinnitus and the potential treatments that might be able to help them. 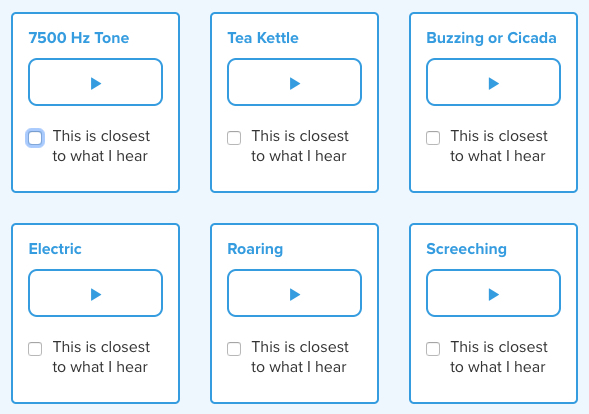 Launched by the UK’s leading provider of evidence-based tinnitus treatments, The Tinnitus Clinic, the ‘What does tinnitus sound like?’ tool lets sufferers choose the sound closest to what they hear and then explains what range of treatments could be best suited. Tinnitus is the sensation of hearing noises in your ears or head when there is no external cause, it is often described as ‘a ringing in the ears’, but everyone’s experience can differ. Between six and eight million people in the UK suffer from tinnitus. This number is increasing as the population ages and younger people are exposed to loud noise through excessive earphone use and recreational noise such as live music shows and festivals. Chief Audiologist at The Tinnitus Clinic, Mark Williams, said: “Whether it’s a whistle, constant hiss, low-frequency buzz or high-pitched ringing, the sounds caused by tinnitus are all in our heads. “No two people’s experience of tinnitus is the same, tinnitus is personal to the individual, so each patient therefore needs a personal service. “We are proud to provide a tailored, caring service that is very much geared towards understanding each patient. “This new tool offers sufferers the opportunity to select the noise closest to what they’re hearing, and then goes onto explain some of the potential treatment options which might be able to help them. “Even the fact that other people will be able to listen to the sounds and get an insight into what tinnitus sounds like for those who live with it can be a huge relief for sufferers. The Tinnitus Clinic provides multidisciplinary solutions which are individualised to the persons’ tinnitus, lifestyle, approach and response to treatment. The Clinic only offers treatments and devices that show the strongest scientific evidence and highest chance of a successful outcome. You can try the tool for yourself here.